Half sleeve tats stretch from shoulder to elbow. 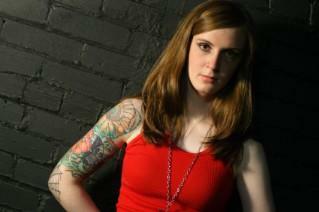 Half sleeve tattoos are becoming more common as tattoos edge their way into mainstream culture. The popularity of shows like A&E's Inked proves that tattoos, once reserved for easily hidden areas like shoulder blades and ankles, are now being worn as a source of visible pride. 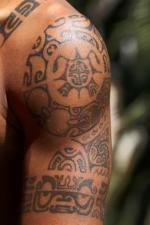 The tattoo known as a half sleeve covers from the upper part of the shoulder down to the elbow (just slightly longer than a short-sleeved shirt). Quarter, three-quarter, and full sleeve tattoos are also becoming more conventional. The path to getting a half sleeve tattoo usually comes about in one of three ways. Groups of smaller tattoos that were inked over the years that someone wants to connect by making them into a half sleeve. As a planned large tattoo, usually with a theme throughout the sleeve. A half sleeve may be a stopping point in the course to getting a full sleeve further down the road. As anyone with tattoos can attest, getting them done can be addicting. For people who have several designs on the same bicep, a simple design can be done to connect the original artwork into a half sleeve effect. Unfortunately, some people with tattoos may not like their original design. Instead of having the tattoo removed, they may choose to have an artist create a design that blends the old tattoo into a half sleeve. Planning a half sleeve tattoo as an original piece of work should not be taken lightly. This is a large area of skin to cover, so you want to be sure the work is meaningful to you. Choose your artist wisely, as she/he will be working closely with you to create your design. Full sleeve tattoos can be incredibly time-consuming and expensive. Those who are planning on getting a full sleeve may stop at a half sleeve for a period of time. Whether it is to save money or rework the rest of the original design, a half sleeve can be a stopping point for many on the road to getting full sleeves. Have I ever had a tattoo? If not, am I comfortable getting such a large work done as my first design? Can I choose from several different talented artists in my area, or is there only one option? How much money am I willing to spend on my tattoos? Do I want to create a custom design, or am I okay with using some flash tattoos? A final consideration is that of your workplace dress code. While a number of workplaces do not ban tattoos all together, they may require tattoos be covered or hidden, or that the tattoo design adheres to a code laid out in the handbook. Recently, the Marine Corps banned visible half sleeve tattoos on leathernecks. Persons already bearing sleeves will be grandfathered in with documentation regarding their tattoos. A half sleeve tat that weaves together several smaller, unrelated tattoos is often done by using symbols or simple scrolling designs. Covering up previous tattoos often involves coming up with a new design that obscures the original art. Original tattoo designs often relate back to a defining moment or person in your life. Whether you have a half sleeve that has your children's footprints and names worked into the sleeve, or incorporates Chinese symbols to commemorate an important trip, you should plan your tattoo design with care. Getting half sleeve tattoos on one or both your arms is a personal decision. Make sure the design you end up with is quality artwork that you will take pride in wearing for the rest of your life.